Scene in Cleveland: Newsies, Les Miserables, Alton Brown Live! There’s been a bit of a delay in the posting of my Disney Newsies the Musical response. That’s in part because I had so many other theatrical ventures that week, all of which will be recounted in this “Scene in Cleveland” Omnibus Edition! Actually everyone in the cast. 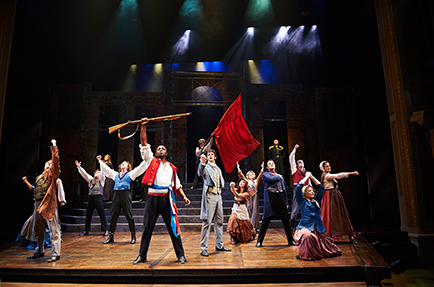 Great Lakes Theater Company, “Cleveland’s Classic [and they use that term BROADLY] Theater Company”, brought this city it’s first professional local production of Les Miserables (which the cast performed in rep with a production of The Merry Wives of Windsor). The intimate production, which closed yesterday, received good reviews and word-of-mouth-buzz and sold out it’s run. When I bought my ticket, two weeks in advance, my seat was the last one in the house. I’ve never been fanatically interested in Les Miz, but it’s melodic score and epic storytelling merit annual revisits, and Victoria Bussert’s production ably scratched the itch. The small cast was solid and capable. Though the doubling of parts has alway been a part of the Les Miz tradition, it was particularly heightened here (Fantine and Eponine returned to the chorus mere minutes after their respective SPOILER ALERT: deaths), giving the audience a sense a familiarity with even the smallest of ensemble parts. The evening was well paced, and the story telling mostly clear (though I offer a king’s ransom to the production that clearly explains what the hell that revolution is actually about). I don’t necessarily resent the use of a GREATLY reduced orchestra, I do wish I had been done more artfully, with real instruments and without relying on (quite frankly ludicrous) synthesized approximations of swelling strings and other clearly artificial sounds I heard at the Hannah Theater. The standouts in the company were Pedar Benson Bate as a beautifully sung Marius, Tom Ford as Thernardier, Calista Zajac as Young Cosette, and Alex Syiek as Grantaire (which is, I’ve decided, the best part in the show). Alton Brown Live! The Incredible Edibles Tour, which made a one-performance stop in Cleveland, is definitely geared towards pre-existing Alton Brown fans (Brownies? ), as opposed to the uninitiated. Not that someone who’s never seen Good Eats or Cutthroat Kitchen wouldn’t appreciate it the evening, it’s just that the evening is more about Alton that it is about food. There are two very entertaining and highly theatrical live cooking demonstrations of the “don’t try this at home” variety, and the reaminder of the evening is centered on Brown’s anecdotes and relationship with the audience. And songs! I was deeply disappointed when the house lights came up and the end of each act and could have easily spent another hour. He is absolutely as funny, charming and engaging onstage as he is on the small screen, and the over two hours were the breeziest I’ve ever experienced in a theater.